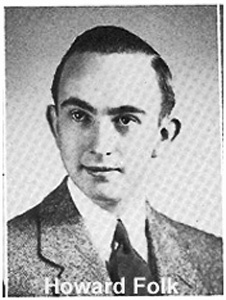 Howard G. Folk Jr., 87, of Conyngham passed away Friday evening, June 19, 2015, at Fritzingertown Senior Living Community, Drums. Born in Coaldale on Jan. 28, 1928, he was the son of the late Howard G. Sr. and Priscilla (Williams) Folk and spent the past 55 years in Conyngham after moving from Coaldale. Howard was a 1953 graduate of the Philadelphia College of Pharmacy and Science with a Bachelor of Science degree in pharmacy. He worked as a pharmacist in the family pharmacy in Coaldale before founding the Conyngham Pharmacy in 1960. He later turned operations over to his son in 1972, and worked as a pharmacist at the White Haven Center and in retail pharmacies. He was a member of St. Peter’s Episcopal Church, Hazleton, and was a 32nd-degree Mason with the Hazle Azalea Fellowship Lodge 327, Hazleton. He was also a U.S. Navy veteran of World War II. He was preceded in death, in addition to his parents, by his wife, the former Vera M. Shubeck, on Dec. 27, 2000; and a stillborn grandson, Michael, in 1979. Surviving are his son, Howard M. Folk and his wife, Gail, Conyngham; two grandchildren, Matthew Folk and his wife, Amy, Chambersburg; and Stefanie Holiat and her husband, Gregory, Portland, Ore.; and three great-grandsons, Nathaniel, Hudson and Thomas. A private graveside service will be held at the convenience of the family in Conyngham Union Cemetery. Memorial donations may be made to the Hazleton Animal Shelter, P.O. Box 481, Hazleton, PA 18201. Harman Funeral Homes and Crematory Inc. (East), 669 W. Butler Drive, Drums, is assisting the family with the arrangements.